"Vietnamese chicken noodle soup. After ordering this soup at a local Vietnamese restaurant, I decided to try to make it at home. This is a very flexible recipe. Feel free to substitute some of your favorite vegetables or try different noodles. Enjoy!" Heat vegetable oil in a large saucepan over medium-high heat; saute onion, mushrooms, and garlic until tender, 5 to 10 minutes. Add water, rice noodles, and chicken bouillon to onion mixture; bring to a boil. Reduce heat to low. Mix shredded chicken, green onions, and cilantro into soup; simmer for 5 minutes more. 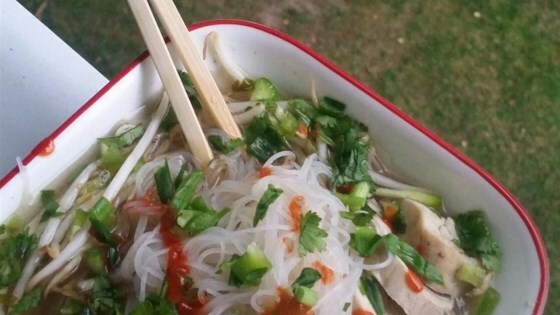 Transfer soup to serving bowls and top with bean sprouts, a squeeze of lime juice, and Sriracha hot sauce. See Chef John’s tasty version of spicy Thai chicken soup. I like to use a rotisserie chicken from the grocery store to save time. Try adding ginger and fish sauce to the soup and garnishing with basil and jalapeno for a more authentic taste. Just a note, if you put the rice noodles in when the recipe says, they will disintegrate. They only need to be soaked in hot water for a minute. Drizzle with sesame oil before serving. Great, simple recipe. I made it vegetarian by using veggie bullion cubes & tofu, then added jalapeños for some extra spice.